If you are looking to change the game this St. Patrick’s Day, look no further. 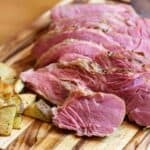 Cooking sous vide creates a juicy, tender corned beef like you have never had before. So go ahead and kiss goodbye to dry, chewy corned beef forever. In this recipe we keep it simple by picking up a pre-brined corned beef with a pickling spice packet included. This is the definition of an easy cook with incredible results. Now you can celebrate St. Patty’s Day the right way with easy, delicious corned beef and a couple pints of Guinness. Enjoy. Through loads of experimentation, we’ve found that cooking the corned beef at 135F for 48 hours is the perfect combo. Leaving the beef in for 48 hours breaks down the connective tissue (collagen), which results in an extremely tender meat. Also, cooking the corned beef at a temperature of 135F is the sweet spot for that perfect edge to edge rosy color. 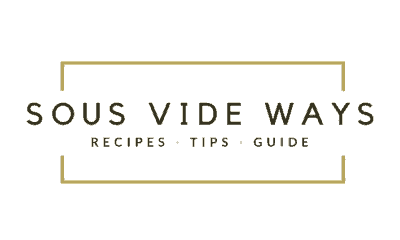 Just make sure you have a reliable sous vide that accurately regulates the temperature of the bath or your results may vary (check out the Anova or Joule). For other time and temperature options, check out our cooking guide here. Cast Iron Skillet – If you are looking to take your searing game to the next level, we recommend investing in a cast iron skillet. By using a cast iron in this recipe, you’ll achieve a deep sear on the corned beef. Cast irons are also extremely handy for searing just about any and all sous vide meat. Lodge offers the best quality and price, which is why it is our favorite cast iron brand. Rub pickling spice packet on the fat side of the corned beef. Put the corned beef and beef broth in a freezer bag, and remove the air using a vacuum sealer or the displacement method. Drop bag in the bath for 48 hours. To finish the corned beef, heat up skillet on medium high and sear all sides. Alternatively, place the corned beef under the broiler for 1 to 2 minutes. Make sure to watch closely to ensure the meat does not get burned. Serve with cabbage and potatoes, and enjoy the juiciest corned beef ever! I am curious about why you add broth in the sous vide bag? Is it necessary? Hi Evelyn! I don’t believe it is necessary to add the beef broth, however, the broth makes the corned beef a little bit more juicy and adds some extra flavor so I would recommend it. Hope this helps! Great recipe. Excited to make this for my family for St. Paddy’s day!